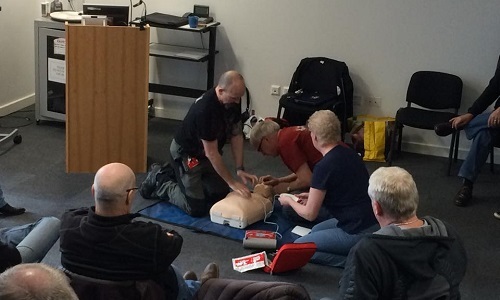 Dawn led the First Aid refresher course for our Road Crew on Saturday, helped by Shaun and Greg, at Pegswood Fire Station. It was a great turn-out by everyone – it is vitally important that they get this training so that they know what to do in case of emergency, either within our own group or if we come across an accident when out riding. We’re very lucky in Geordie Chapter to have such knowledgeable people to provide the training too. Dawn started with a presentation describing some of the symptoms and immediate measures associated with choking, bleeding, shock and broken bones. It was a very interesting discussion with a lot of the group able to describe situations that they’d encountered previously. 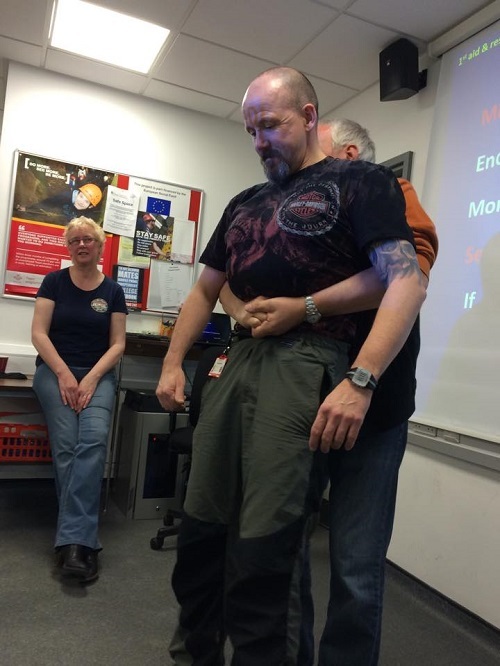 On the practical side, Shaun stood firm while Greg demonstrated back slaps and abdominal thrusts. These are quick actions that they can take in the event of choking – eating, drinking or even swallowing insects when riding. Dawn then described the way to deal with someone who is unconscious and not breathing. This provoked considerable discussion about the right way to do things and in which order. Shaun took the floor and reiterated that speed is of the essence. He said ‘as soon as you’ve determined that you are safe to approach the person or accident, seconds can count, so once you’ve made your assessment then get on with it’. 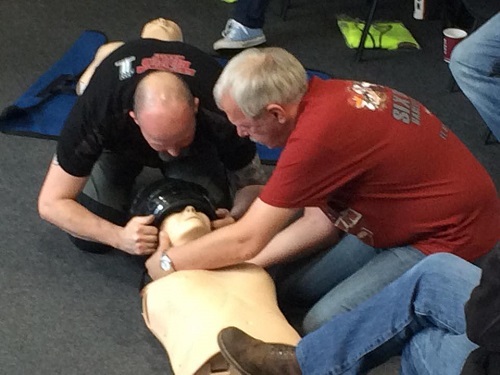 The Road Crew got stuck into the practical side of cardiopulmonary resuscitation, more commonly known as CPR. This comprised the timing, interval and number of chest compressions and rescue breaths. 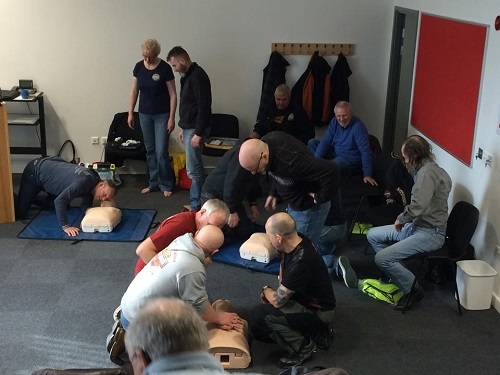 There was also a further practical exercise with the defibrillator. Al said, ‘as far as we know, only two chapters in the UK carry a defibrillator and Geordie Chapter is one of them. Everyone in the Road Crew also carries a mini First Aid kit’. 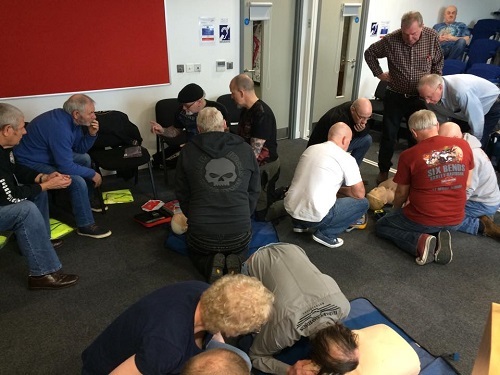 Towards the end of the session, Dawn, Shaun and Greg gave a quick round-up of what else can be done – removing a helmet from an injured person, turning someone over, the recovery position, comforting people etc. All valuable lessons. The Road Crew gave up their spare time to make sure that they’re fully prepared for medical emergencies. Let’s hope we don’t have to call on them when we’re out and about. If you would like to know more about the Road Crew or the First Aid training then contact Al, our Head Road Captain. Use the Contact Us form to get in touch.